From an American who spent several years in Australia comes this debut about a man, very much like the author, who’s writing a collection of stories about his family. “I divided the essay into small sections (one on my grandfather, one on my grandmother, one on my mother growing up) and found that if I changed my name—that is, if I called myself Sam Brown—I could write about my own experience with more objectivity.” This comes late in the narrative but speaks volumes about the impetus of this short novel. Sam Brown’s mother and grandmother are both dead, and both were writers trying to write in a cabin on the brink of the Australian outback. In fact, mother tried to reenact grandmother’s vanishing act—a disappearance down the Giant Stairway, with only a few manuscript pages left in her wake. 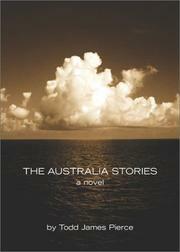 Years later, after Sam marries and divorces in far off Los Angeles, he returns to Australia, where he’ll find a new love interest, though “on that day, I understood my sadness was not ending, but beginning, which was something I had not known until just then.” What follows—or precedes, really—is a jumpy collection of stories or essays about Sam’s family, the many divorces, the handed-down desire to make a record of things, tales of Sam’s Tom-and-Huck friendship in Australia when he was there for a year as a boy, all of it dull and dreamy and haunted by the lingering mystery of what happened to Sam’s grandmother. We’ll find out, but not before a lengthy lesson in how and why these essays or tales came to be—a satisfying trip through storytelling and emotional genealogy. The thread that’s supposed to bind these pieces into a novel is thin at best, but Pierce writes with a particular tenderness and compassion.